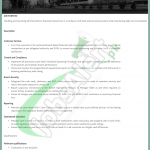 Tap this page and have HBL 200 Cash Officer Jobs 2019 Male / Female Apply Online Latest Advertisement from www.hblpeople.com. Jobs in HBL Habib Bank Limited are available and it is seeking for critical theirs, decision makers, team players, problem solvers and dreamers against the 200 positions of Cash Officer/Cashier/Teller. Candidates from all over Pakistan can apply for these positions which are on a Permanent basis and these positions are based in different cities of Pakistan and it is the finest opportunity for the Graduate pass fresh candidates to be part of such type of reputed Bank of Pakistan working superbly in Pakistan and Internationally. HBL is the short name of Habib Bank Limited which is the reputed commercial bank of Pakistan that it has numerous branches in every city of Pakistan and it has also established its branches internationally in different countries. HBL Jobs are Banking field jobs announced for the qualified individuals and there is no advertisement for HBL jobs found in newspaper and currently we the team of JobsAlert.pk providing you the latest HBL Jobs 2019 announced at the official site of HBL which www.hblpeople.com and its image can be examined from the following where numerous new HBL Jobs are given. Both male candidates who desire to be part of HBL are welcome to apply but they have to compare themselves with the eligibilities mentioned in the following image and according to the criteria candidates should possess Minimum Bachelor’s Degree but preference will be given to candidates having B.Com / BA / BSc / BBA / MA / M.Com / M.Com and there is no need of experience for these jobs. All interested candidates should submit their applications as per the following how to apply procedure given in the next heading. Interested candidates from all over Pakistan can apply via online at the official site of HBL or through web link given below. To Apply Online you need to first Sign-Up and after creating an account you'll have access to the vacant positions and online application form. The last date for submission of application is April 10, 2019. Only online applications will be entertained for selection procedure and application other than online will not be considered. Our mission is to provide quality vacancies to our daily viewers and to maintain the level of service today we provide you HBL Cash Officer Jobs 2019 Cashier / Teller (Male & Female) holding at least Masters/Bachelors qualification and have a passion to build up their future in the banking field. So, apply as soon as possible and be the first to join Habib Bank Limited.